"Rosie is the best clown I have ever seen... the kids were so excited and they really had a good time." "All the kids had TOOO MUCH FUN. I heard a lot of positive feedback from my guests too." "Just wanted to drop you a note to say that Sofia's party was a hit!! She, along with her friends, and adults, had a blast!!! You were absolutely amazing! Thanks very much for entertaining everyone so well." "Justina and everyone had a great time, even the adults loved you. Justina said she wants you back for her 5th b/day. Also the parents said the kids could not stop talking about you." "Thank you for a wonderful performance from Rosie. The kids were so happy, and the parents cannot stop talking about the magnificent show that she put on." "Thank you so much. The kids loved you as well as the adults. Great job. Melissa loved her birthday." "I booked Rosie the clown last year for my kids birthday party and she was amazing. She was also booked the following month at my cousin's kids birthday party. Everyone was impressed with Rosie - not just the kids." "Thanks very much to Rosie for making Koren's 4th birthday a delight. The guests as well as the birthday boy were enthralled. ... Koren spontaneously shared today that you were great!" "The children loved Rosie. Everyone admired the balloon art." "i would say that [Rosie] was the best clown i had ever seen... the kids were so excited and they really had a real good time.. you were having a real good talent in controlling all the kids according to ur tune and we all just loved it... I was getting all kind of enquiries about you and im definitely gonna give ur details to anyone who needs the best clown for their occasions..."
'It was great having you at Cayali's birthday party. We had our nieces and nephews over just before Christmas, and the first thing they ask, is Rosie coming? If I say I am having friends over, they ask, yep, is Rosie coming? I don't know if I could ever plan a birthday party again for Cayali without Rosie!!" “Rosie is an energetic entertainer. She is fun for all ages from child to adult. Thank you for a wonderful show." "Thank you for making Saturday workshop so much fun. All my students were still talking about Rosie this week. They said that she was the best part of the weekend." “Just wanted to let you know that Rosie was amazing. I cannot believe that in the midst of all that, the kids actually paid attention to a show. Also, Lydea LOVED Rosie. She had the best birthday! We will definitely recommend you and book again. Thanks again!" "We received very positive feed back from children and their families. We thank you for joining to our Bayram celebration. We had a wonderful time." "Thankyou to Rosie the clown for making our evening so special. We loved having you over at our place." "Wow! What vibrance and energy was brought to the Gardening Fesival by your participation in our Family Fun Night. Thank you so much." "Rosie the Clown is a great entertainer. She is always full of energy and life." "Rosie was a big hit at Hay Day. The children loved her." "The kids are still talking about what a great time they had. You truly have a special gift. Rosie helped make Cassidy's 7th birthday very special." "Thank you for coming to our event and making it so memorable for the children. They had a wonderful time with you. The feedback that I am getting is that the children are still talking about you and your tricks. Job well done!!" "Thank you so much. It was very, very good for the kids." "Rosie kept the crowd laughing." "For a few years, we had a hard time to keep our children entertained at our anual Kids Christmas Party. Then one lucky day, I found Rosie the Clown. Now, this will be our third year that we have hired Rosie. We love her; our children love her. Thank you, Rosie, for making my life a lot easier at Christmas time." "Thank you for everything you did today! The kids absolutley loved you, and you put on a great little show for all! Will definitly be recomending you to all my friends for parties!" "Thank you for being part of Tiago's second b-day party. We had fun!!!" "Your obvious enjoyment in interacting with the little ones along with your energy and enthusiasm makes your performance a joy to watch. You are indeed a gifted performer. You were wonderful!! Many thanks for a job exceedingly well done." "I just want to say thank you so much for a wonderful time that you shared for my son Jalen's 1st birthday party. All the kids enjoyed your performance. Now, you are the clown of our family. I'm looking forward to working with you again! See you at the next party!" "it's nice to deal with someone so professional." "I would like to thank you for doing such a wonderful job at Abhishek's b'day party. All the kids had TOOO MUCH FUN. I heard a lot of positive feedback from my guests too." "Thank you for a wonderful show. The kids had a fabulous time." "We had a fun time with Rosie and would refer her to our friends and family!! Keep up the great job!!!" "Thank you, Rosie, for coming to Declan's party on Saturday. He and his friends had the best time. It was so much fun to watch! Rosie is very talented and has a wonderful way with kids. I loved watching them sneak closer and closer to her. They all but mobbed poor Rosie. I hope to see Rosie again in the future!" "My son and daughter enjoyed very much the party with your excellent performance!" "The kids really liked your presence at the festival. I'm looking forwared to working with each other again." "Every one had a good time . . . Rosie was great and the kids had lots of fun." "I just want to thank you for being a part of our walk-a-thon. It really was a success! Thanks for the part you played. The children loved having you there!" "You were great! We'll certainly keep you in mind in our future parties." "We had a wonderful time. The girls are still talking about your silly songs." "I was so happy that Rosie the Clown kept the children entertained. Rosie the Clown took charge of her role and played it perfectly. Many of our guests mentioned that Rosie the Clown did a wonderful job. If we decide to have another party, you can bet Rosie the Clown will be there." "Thanks so much for Sunday! The kids really loved you; I thought a few were going to pile into your car with you when you were leaving! We will definitely invite you back for our picnic next year!" "I ... write to you to thank you for the wonderful time the Kids had and to pass the thanks of all the other parents. Everybody was so happy and you really gave us all a wonderful time." "Everyone had a great time! Thank you so much!" "The kids had a great time with Rosie the Clown! It was raining and I was very disappointed about that. But Rosie the Clown saved the day." "I just wanted to send out a special thanks for attending our Spook’tacular Halloween Fest. I really enjoy your entertainment and I am more than sure based on the smiles and laughter coming from the children they also enjoyed your company!!" "Thank you soo much for Saturday, you were wonderful with the kids and they loved you! I will definitely recommend you to friends and family." "Thank you soooo much!! Kids had a BLAST!" "The kids had lots of fun." "We certainly did have record breaking crowds yesterday at the most successful Winterfest ever! We appreciated how popular your face painters were and the addition of your balloons to the enjoyment of all the children's activities." "Rosie the Clown was fun, energetic and really knows how to talk to children. My son wanted the Hulk and a black horse balloon; he remembers that day at Winterfest and had a blast, thanks to Rosie." "The kids loved their time with Rosie. The big kids-at-heart also enjoyed themselves and were asking for your contact information. I will gladly refer you to anyone asking about birthday entertainment Thank you so much for making the party happily memorable!" "Thank you for bringing fun and laughter to our kids and their parents." "Thanks again for another beautiful performance!" 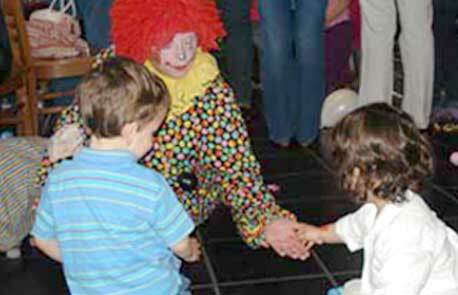 "Thank you so much for the wonderful time we had with Rosie the Clown at Paola’s birthday party, kids and adults, we all had lots of fun." "Rosie was terrific - the kids (and the adults) loved her." "We all had a great time with Rosie the Clown and the children were very happy." "From the moment she walked in to the time she left, Rosie delighted the children with jokes, balloon animals, and magic tricks. She had them laughing constantly! Not only did she make our birthday boy the star of the show, but she also ensured that his younger brother had the spotlight, too. Rosie has a true gift in being able to entertain children of all ages. We would welcome her back into our celebrations any time and would encourage others to do the same. From all of our family, thank you, Rosie!" "Thank you for coming and putting on such a great show! Everyone had a great time and really enjoyed the day. Megan was a bit shy but loved it all none the less. You are a very versatile performer who kept the kids engaged the entire time. That is a true talent. I will recommend you to others." "I just wanted to say thanks for the fabulous job Rosie did on Saturday at our daughter's birthday - all the kids had a really great time and enjoyed the show - it was wonderful." "Our son had a awesome birthday celebration and even the adults had a great time. Julian said 'It was the best birthday ever.' "
"YOU ROCKED MY SON’S BIRTHDAY." "Everyone had fun. Parents were asking about you. We had a lovely time. You are a lovely clown – you know the kids well! Thank you so much! I was impressed!" "Thank you for helping make Sara's 4th birthday party yesterday a fun and memorable one for all. The kids and adults had a great time. Your show was very interactive and entertaining! We all loved it. Thanks, again!" "Thank you very much for the excellent show. Kids had so much fun and my daughters still talk a lot about Rosie The Clown!" "We all had a wonderful time. The kids were very happy that you went, they liked you very much and had fun." "The students had an awesome time. Thank you for being a part of our fun fair." "The kids absolutely loved having Rosie The Clown at the end of the year party. Thank you so much for everything." "We really enjoyed your upbeat and funny persona." "You were awesome! The kids loved you and still talk about you today. From the moment you walked in to the moment you left, you were in character and I thought it was great! Thanks again for a wonderful job!!!!" "My daughter had so much fun." "Thanks a lot for entertaining the kids of Thorncliffe Park. We really enjoyed your show and hope to see you again next year." "Thanks for a wonderful time at Jasmyn´s birthday. The kids loved every minute of it and so did the adults. Jasmyn says she wants you back for her 4th bday." "Thank you, Rosie, for making our BBQ a lot of fun." "The children really enjoyed Rosie the Clown. When the children went back to school, they shared the events with their classmates. It was a great experience for them." "Rosie the Clown did a fabulous job at my daughter’s 8th birthday party, and I would wholeheartedly recommend her. She really goes with the flow. She paid special attention to the birthday girl but she definitely made everyone feel welcome. Rosie wasn’t fussed at all when a couple of the kids were a bit shy. My five-year-old daughter was quite scared when Rosie first came into the party room, but by the time the magic show started, she practically threw herself to the front when Rosie asked for volunteers. Rosie was funny, friendly, and spontaneous. The adults told me they had a great time, too." "We all would like to thank you again your visit yesterday! Your show is really fantastic and I love the way you can handle kids. When Bence went to sleep , he said, 'I'd like Rosie to come to my birthday party every year!'" "You are really something! Kids loved you and the parents too! Thank you so much for everything." "We'll definitely be calling again. We were told it was the best kids birthday party ever. Thanks so much." "We want thank you so much for the effort Rosie put forth. The kids all had a great time and they were all asking to have a clown at their next party. Even yesterday at our hockey practice the kids and parents were all still thanking us for the great time you put in." "All the kids had a marvelous time with Rosie the Clown." "It was wonderful having Rosie the Clown to add to such a lovely event this past Sunday. We truly appreciate her coming out and bringing so many smiles to the faces of both children and adults. We ALL had a fun time! We hope to have her back again for future events that may take place." "I cannot thank you enough. You were fantastic. I have had wonderful comments about you. The children were thrilled and want you back soon. I will call you again when we need to put a smile on everyone’s face." "Thanks so much, Rosie. The kids had an absolute blast!"